American Jacob Sheep are a small, primitive breed of sheep who take their name from the Biblical Jacob, breeder of spotted sheep (Genesis 30:31-43). Jacobs are always spotted, and can be either black and white or "lilac" (greyish-brown) and white. Ideally, they have about 40% colored spots and 60% white. They are called "polycerate," a technical term that means"many-horned." Ewes and Rams are both always horned. They usually have either 2 horns (which curve back over their heads) or 4 horns (2 on top of the head, and 2 laterals on the sides of the head). However, it's possible for them to have up to 6 horns. They range in weight from around 70-170 pounds. Jacob sheep have been kept for centuries in Britain as "park sheep" to adorn the huge estates of the landed gentry. In more recent years, Jacob Sheep in Britain have been crossbred to produce larger, meatier sheep. But the American Jacob Sheep retain the more primitive conformation of the traditional breed. American Jacobs are fine-boned, more slender and deer-like than commercial breeds. 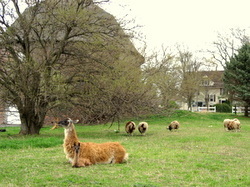 They have a reputation for being hardy, easy lambers, and good mothers, and demonstrate more resistance to disease and parasites than many commercial breeds. The American Livestock Breeds Conservancy lists American Jacob Sheep as a "threatened" breed (which means than fewer than 1,000 are registered each year in the United States, and fewer than 5,000 are known to exist in the whole world). The wool of American Jacob sheep is versatile and delightful for fiber arts such as spinning, weaving, knitting, crocheting, and felting. Jacobs are single-coated with a medium-fine fleece that tends to be open. The standard allows for a wide range of softness and texture, so you can find a Jacob fleece for almost any fiber arts project! Because of their spotting, a single fleece provides both colored wool (black or greyish brown) and white wool, and you can also combine the colors to make a wide spectrum of gorgeous grays and browns. The fleece also takes dye well. For more information on American Jacob Sheep, visit the Jacob Sheep Breeders Association website. Late in 2010, we moved from our life in a small mid-western city to a small farm in northern Illinois with a large, sprawling house and a beautiful round barn, listed on the national historical registry (and with a Wikipedia article to boot!) Our plan was to begin raising sheep. The property had sat vacant for about eight years. Because of the situation of the purchase deal, it took eight months to close on the property, and we really didn't know if we were going to get to live here until the day of the closing. We moved in, got the water working, repaired the dangerous wiring, removed five 20-yard dumpsters full of junk, old engine blocks, a car, a motorcycle,a grand piano harp, and a bunch of old windows that had been replaced years past. Next, we installed 1200 feet of water line (my husband said "Let's do that ourselves and save some money! "; now he says, "I'll never do that again!") He wisely felt we should hire out the new fences. Though only part of our property was fenced at that point (that's another story), we were ready for our sheep! After many months of research and preparation, we began our flock of American Jacob Sheep in June of 2011 with three lovely ewe lambs from Sweetgrass Jacobs in Michigan. We were so delighted with them that in the fall, we added two more ewes, one a yearling and one a lamb, from Three Fates Jacobs right here in Illinois. 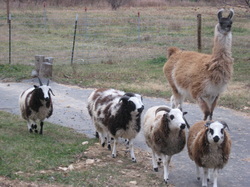 Early this year, we brought home three more ewes from Three Fates--this time bred ewes. So in March and April, we had our first four lambs! This summer, we plan to bring home our first ram. We're enjoying our agrarian adventures, and are so excited to be preserving this lovely breed of sheep. We plan to sell registered breeding stock, along with fleeces and other wool products, as well as meat lambs.